Ultra-sensitive – Measures as little as < 1 fmol cGMP per sample. Flexible – One kit for Extra- and Intra-Cellular cGMP quantification. Convenient – Stable, 4 C liquid reagents. 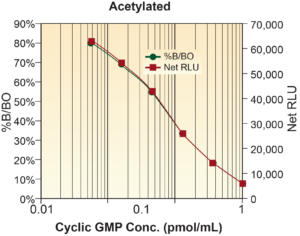 Ready-to-Use – Complete kit with validated Cell Lysis Reagent Included. The aCella – cAMP Chemilumnescent Immunoassay kit is designed to quantitatively measure cAMP present in cell lysates, plasma, urine, saliva, tissue and culture media samples. The supplied Sample Diluent will lyse cells, stabilize cAMP and stop phopshodiesterease activity. 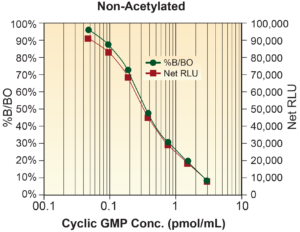 A cAMP standard is provided to generate a standard curve for the assay. The supplied Plate Primer solution is added to the wells of a coated white microtiter plate, followed by standards or diluted samples. A cAMP-peroxidase conjugate is then added to the wells. The binding reaction is initiated by the addition of a polyclonal antibody to cAMP. After a 2-hour incubation, the plate is washed and chemiluminescent substrate is added. The substrate immediately reacts with the bound cAMP-peroxidase conjugate. The generated chemiluminescent glow signal is measured. The concentration of the cAMP in the sample is calculated, after making correction for the dilution. Domek-Lopacinska, K. and Strosznajder, JB. “Cyclic GMP metabolism and its role in brain physiology “ (2005) J Physiol Pharmacol 56 Suppl 2, 15-34. Lucas, K.A. et al. “Guanylyl cyclases and signaling by cyclic GMP “ (2000) Pharmacol Rev 52: 375-414. Ashman, DF, et al., “Isolation of adenosine 3’, 5’-monophosphate and guanosine 3’, 5’-monophosphate from rat urine.“ (1963), Biochem Biophys Res Comm, 11: 330-4. Potter LR, Abbey-Hosch S, and Dickey DM. “Natriuretic peptides, their receptors, and cyclic guanosine monophosphate-dependent signaling functions“. (2006) Endocr Rev 27: 47-72. Waldman, SA and Murad, F., “Cyclic GMP synthesis and function “ (1987) Pharmacol Revs, 39: 163-197. Tremblay J, Gerzer R, and Hamet P., “Cyclic GMP in cell function”. (1988) , Adv. 2nd Messanger & Phosphoprotein Res., 22: 319-383. Matsumoto T, Kobayashi T, and Kamata K “Phosphodiesterases in the vascular system.” (2003) J Smooth Muscle Res 39: 67-86.